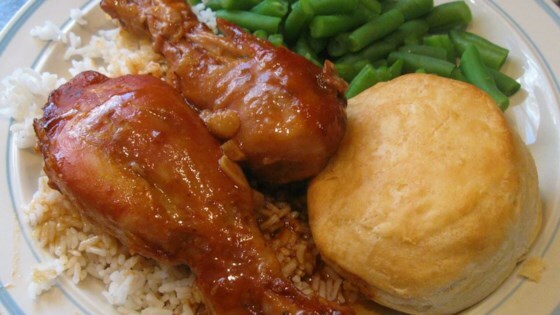 "This is my daughter Molly's favorite chicken dish, very easy to prepare and it tastes great with rice and Asian-style vegetables"
Place drumsticks in a slow cooker. In a medium bowl, stir together soy sauce, brown sugar, garlic, and tomato sauce. Pour sauce over chicken. Cover, and cook on Low heat 8 hours. I used bone-in chicken breasts and coated them in flour first. I also added baby carrots and onions to the slow cooker. And I think it was the best thing I have made in the slow cooker yet. My hubby enjoyed this dish and had seconds. This may have had something to do with my one modification to the recipe - I added a good splash of wiskey to the sauce.